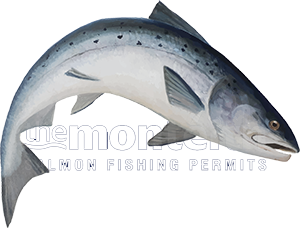 The biggest area where the vast majority of salmon anglers could improve there salmon 'hit' rate is through fly control. Tune your brain into your salmon fly to a point where you can sense its movement in the stream even though you usually won't be able to see it and completely bin any useless thoughts of what's going on above the waterline! When you think your salmon fly has reached the end of the final third of its swing be very cautious and stop yourself from thinking only about the 'relaunch' process! Treat every swing of the fly with suspicion in case a big brute of a fish is 'shadowing' your fly as it finally swings in downstream of you. Salmon are great at 'silently & invisibly' coming for a look so maintain movement in your fly by carefully drawing in line smoothly & consistency as you're hand lining in your running line. If you just whip the running line in too quickly or let the fly sag you may well be missing great hooking opportunities from fish that are following your fly. If a tiny camera was able to be fitted to your salmon fly your heart would be in your mouth on numerous occasions throughout the course of a fishing day so it's important while salmon fishing you pay attention to what you're seeing and also to what you may not be seeing!